Shades control light and provide privacy when used alone or with curtains. Because they fit close to windows, shades are also energy efficient. Shades can be mounted either inside or outside the window frame. The screws can be inserted on either the I” or 2″ (2.5 or 5 cm) side of the mounting board. This will determine how far from the window your shade will hang. Roman shade is the basis for stitched-tuck, hobbled,cloud, balloon and insulated shades. 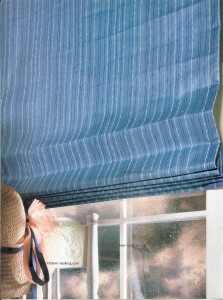 These shades are raised and lowered by a system of cords and rings which cause them to pleat into soft folds when raised. Stitched-tuck shade has small, top stitched tucks along the folds of the shade. These tucked rows alternate between the front and the back of the shade, giving the pleats a crisp look. Hobbled shade is two times the length of a flat Roman shade. Excess fabric is taken up in permanent soft folds between each row of rings,giving the shade a bubbled look when lowered. Cloud shade is cut two to three times the width of the window, then shirred across the upper edge to create a soft heading. The lower edge of the shade falls into gentle poufs. Balloon shade is also cut two to two and one-half times the width of the window, but its fullness is folded into over sized inverted pleats at the heading and lower edge. This shade also has permanent poufs at the bottom. Insulated shade is a basic Roman shade made with insulated lining and a magnetic edge-seal. These shades block out heat or cold, and help regulate temperature extremes at windows. Roller shade takes on a custom look when made to coordinate with fabrics in the room. These shades, stiffened with a fusible shade backing, are easy to make because they require very little sewing.